Kevin O'Conor of London Power (inventor or power scaling and amp expert) wrote about carbon comp resistors : "Old technologies never die-even if they should." Sadly many people on the internet and even builders often talk about those little brown carbon based resistors with reverence. These same people claim the tone in their amp is due to the use of carbon resistors. You can find forum posts about how a person’ amps has acquired magical properties from switching over to carbon comp resistors or claiming that they are difference between a good and bad amp. They are of course mostly wrong. Good tone in an amp is achieved by good circuit design and not a result of magic parts. You do need quality parts for good sound but by using the conventional wisdom that better-parts-make-the-amp-sound-great we could make any amp design sound good by using different parts. In practice is does not work that way. A bad design will sound bad. Why do all many vintage amps have Carbon Composition or carbon film, resistors in them? 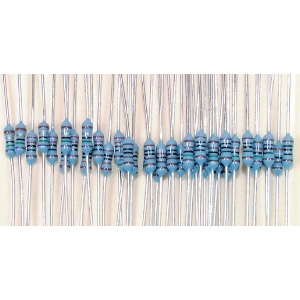 At one time (the 1940's to the 1960's) carbon composition resistors and later carbon films were the only types of resistor available for low wattage use and the cheapest. Pretty much all electronics had them (no TV screens did not look better because of them!). Even after the advent of quieter carbon films Fender and others continued to use them because they were cheaper and consumers at that time expected some noise with their electronics. Marshall and other used often used carbon films. These were little quieter and a more reliable. Many of these older amps used 20% tolerance resistors which meant resistor values were all over the place making amps inconsistent sounding unit to unit. Why do many modern amps have them? Many production amps (lower cost tube amps) have carbon film resistors because they are cheaper than other types saving the builder a few bucks per unit. Boutique makers often use the older carbon comp types to exploit unknowing buyers, out of a lack or education, pure mysticism, or a desire for the inside of their amps to look old timey. None are good reasons to include them in an amp. They should only be used if a difference in sound is possible or desired. There are steep trade-offs for using carbon based resistors: shorter service life, extra noise and the potential for fire. Do they have special tonal properties? In 98% of circuit positions in a tube amp circuit carbon comp and film resistors only add noise. In some positions they can distort the audio signal which is sometimes (not always) desirable. This only occurs in circuit positions with both high DC voltage with a large superimposed AC signal. Certain plate resistors positions in an amp will sound slightly different with carbon comp or carbon film resistors. In some of my amps I will use carbon comps in these positions for extra flavor. Judicious use is wise. No amp will need more a handful of carbon resistors for this purpose. What problems do they present? Carbon Comps and Films are noisy and make amps have more hiss, pops, and sizzle. They get even nosier over time. That pan frying sound you hear in old amp is the sound of carbon resistors. Carbon films are a little quieter but not as quiet as metal film, metal oxide or wirewound resistors. Over time they can drift in value so they need to be replaced for the amp to sound the same or sometimes even work correctly. In some positions they can catch fire if something goes wrong. Through the 1980s on Fender, Mesa Boogie, and others often used them as power tube screen resistors. If a tube shorts out they literally go up in flames! It is dangerous and they should NEVER be used in those circuit positions. Despite this fact many boutique and small builders use them in power positions. Do modern metal film, metal oxide and wirewound resistor sound harsh? No. They simply have less noise and do not drift in value. 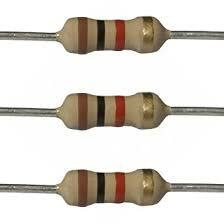 In short they behave more like an ideal resistor. You can find metal films in 1% tolerance so the amps with those are very consistent in sound from amp to amp. 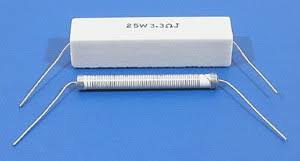 Most metal film, wirewound and metal oxide resistors are flame proof so are safe to use in power resistor applications. They cost more than carbon film but are well worth it. Having a quiet amp that has less need of servicing is very good thing!